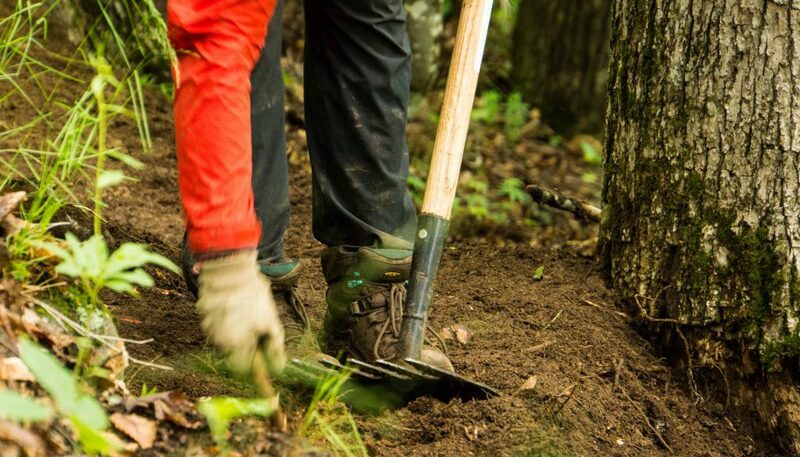 Trail-building is an immensely rewarding activity, and one that can be performed by people of all ages and physical abilities. Do not be intimidated by it! 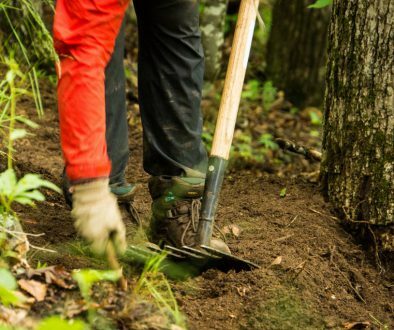 Trail-building is simply the process of creating a clear, comfortable and low-impact walking path through wilderness areas. Sometimes, if land is flat and unadorned by trees, pits, or rocks, this is straightforward. More often than not, however, we work in more difficult terrain to make previously inaccessible areas available for hikers to explore. The process is relatively simple. Using a special set of trail-building tools with funny names like ‘pulaski’ and ‘McCleod’ and ‘hazel-hoe’, we set about cutting a wedge into the land to create an almost flat, 1 meter-wide walking path. This is called the tread. Tread needs to be slightly outsloped to allow water to run off it. Water is the enemy of the trail, and minimizing the amount that settles on a path is a fundamental goal of trail building. With this mind, the tread is built with a gradual backslope above it. A slope stops water from falling vertically onto the tread and creating an unwanted gutter along its inside edge, known as the hinge, where water could then pool and turn the trail into a muddy mess. The same goes for the outside edge of the tread, where a gradual slope is desirable so that water flows off of the trail smoothly and does not destroy the tread’s edge, which is called the berm. The flatter the land being worked, the more gentle the backslope and outslope. If working on steep terrain, the gradient of each of these can be substantial, as steep land is the most affected by water. In very steep sections of trail, drainage structures or grade reversals are often required. These can be most simply described as dips in the trail which gives larger amounts of water a place to run off naturally. This may sound complicated in writing, but it is very straightforward in practice. By the time your two weeks are up, you’ll be a trail-building pro, and you’ll know exactly what all this jargon means! Before work can be started on the construction of the actual tread of the trail, a way through the terrain must be cleared. This requires people with loppers, saws and axes to move along the proposed route clearing fallen trees, overhanging branches, roots, and other obstacles that would get in the way of the trail – a process known as brushing, or brushing out. This is also a common task for trail maintenance, as keeping branches and debris off of already developed trail is essential to keeping hiking paths viable for users. Building trail generates a lot of mess, making finishing a very important job. People assigned to finishing crews work at the back of trail, beautifying and naturalizing what has just been constructed. Without this process, dirt mounds form, leaves get trapped and create false trail edges. Simply put: the trail does not look good. One of the central reasons we build trails is to encourage people to walk them and engage with the nature around them. So it’s pretty important that hikers are not left looking at the trail work itself instead of enjoying the outdoors. Finishing achieves this. These are the basics, but there is much more that goes into trail than just these tasks. You might be helping with dry-stone masonry constructing retaining walls and drains; switch-backs are often built; steps are used in very steep sections of trail where appropriate, and bridges built for the safe crossing of rivers and gullies. 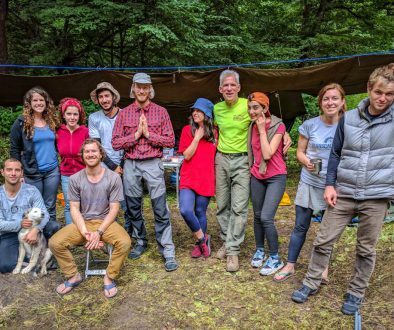 Work on the trail is diverse, and in joining a TCT volunteer camp you’ll get to experience many aspects of it. 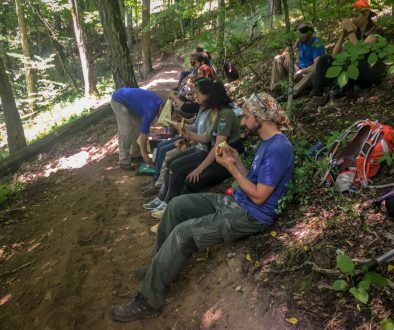 As well as learning new skills, you’ll also develop an appreciation for just how much work and expertise goes into the trails you will hike in the future. In other words – hiking will never be the same again! Sign up here to secure your spot on a crew this summer! Applications remain open until April 15th. See you on the trail!